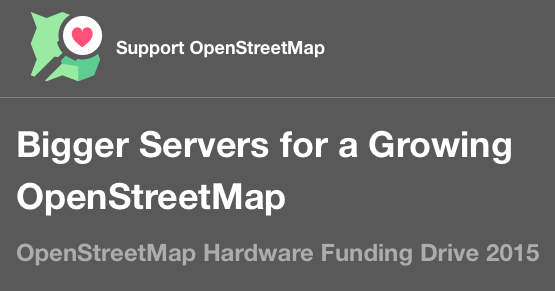 The Operations Working Group of the OpenStreetMap Foundation manage the core servers of OpenStreetMap and plan server upgrades to scale for our growing community. They make purchasing decisions around server hardware with the budget they have available. With your help, we can continue to grow the OpenStreetMap infrastructure to support the growth of the community and map. See the FAQ for some answers to frequently-asked questions, or get in touch to start a discussion. Update: 36k Raised. 20k to go: Big thanks to Mapbox and Mapzen who kicked off the donations each with $20,000! What else can we do to support OpenStreetMap? If you have contributed data to OpenStreetMap, or time to helping organise mapping activities: thank you for everything you’ve already done! OpenStreetMap only survives because of the work put in by thousands of hard-working and selfless volunteer contributors. If you are one of these people, then you are already doing a great thing for the project. Join the Foundation and support the body which supports (but doesn’t control) the project. By being a part of the Foundation, your voice can be heard in discussions about how the Foundation is run. Join a Working Group and give your time to solving those issues which require greater commitment. Being on a Working Group, as the name suggests, is hard work and requires diligence, but can make a huge difference to the project. Donate money to the hardware funding drive. Whatever you can spare will be gratefully received and put towards hardware which is necessary for the continued growth and success of the project. Whether you use OpenStreetMap data in your products and services, or are just interested in helping, corporate sponsorship of OpenStreetMap events and hardware helps the project to keep going and be inclusive. Join the Foundation as a corporate member. Your support of the Foundation will be greatly appreciated and publicly lauded. Donate time. Some of your employees might jump at the chance to be more involved with OSM, so why not give them a “20% time” to join a Working Group or contribute time to a project which helps OSM? Donate money to the hardware funding drive. Any contribution will help and is gratefully received. This entry was posted in Uncategorized on June 6, 2015 by Matt Amos.